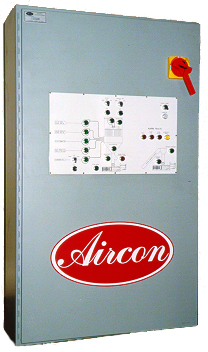 Our control panels are custom-made for your specific plant needs. What used to take several hours can take seconds and provide up-to-the-minute maintenance check information as well as assist with troubleshooting. Enclosures can be made for existing plant layouts or for future expansion. We can include everything from monitoring high-level alarms to interfacing with plant fire alarms and paging systems. From sequencing start-up and shut-down to spark detection systems with multiple abort gates and maintenance history printouts, let Aircon’s experience work for you!